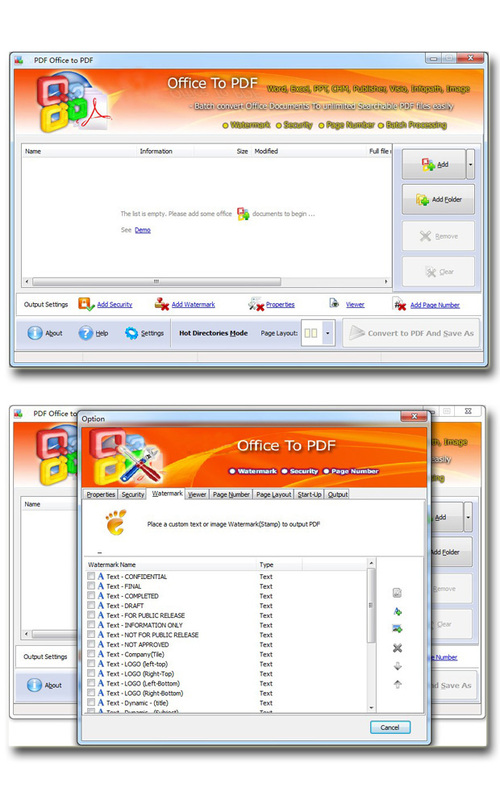 Easy Office to PDF 1.0 Free Download - Easily batch convert Microsoft Office 2003-2010 to PDF file! Easily batch convert Microsoft Office 2003-2010 to PDF file! Last Updated: 8/15/2012 | File Size: 27619 KB | Price: $49 | Downloads: 105 | Developer: Easy PDF Tools Ltd.
Easy Office to PDF is a professional and extremely-fast application, providing convenient way to batch convert existing Office documents(Word, Excel, CHM, InfoPath, Publisher, Visio and PowerPoint) and images into high-quality PDF documents. It supports Microsoft Office 2003, 2007 and 2010. There are three modes available, including batch mode, hot directories mode and command line mode. And its intuitive interface facilitates you to accomplish converting with greater efficiency. Statement: First, please download the orginal installation package by clicking the download link. Of course you may also download it from the publisher's website. Using Easy Office to PDF crack, key, patch, serial number, registration code, keygen is illegal. The download file hosted at publisher website. We do not provide any download link points to Rapidshare, Hotfile, Depositfiles, Mediafire, Filefactory, etc. or obtained from file sharing programs such as Limewire, Kazaa, Imesh, Ares, BearShare, BitTorrent, WinMX etc. Software piracy is theft. If you like Easy Office to PDF please buy it.